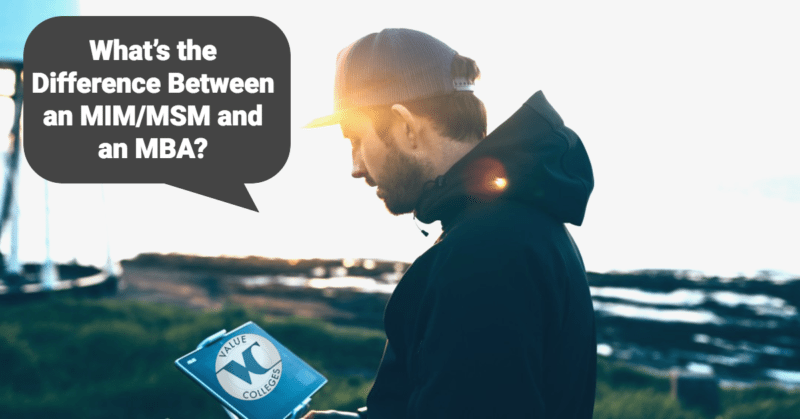 What’s the Difference Between a Management and an MBA Degree? For well over a century, since it was first introduced at Harvard University in 1908, the Master of Business Administration has been the standard terminal degree in business (the highest in the field). Over the 20th century, specializations proliferated, from management to finance, international to entrepreneurship, while the 21st century has seen specializations like information technology added to the traditional MBA. But the MBA degree is not a one-size-fits-all program. In today’s business world, with its endless wrinkles and complications, it couldn’t be. That’s why, around 20 years ago, a competitor emerged in Europe, where the MBA was not as deeply entrenched – the Master’s in Management. It goes by different names; at some institutions it’s called a Master of Science in Management, while other variations include MS in Business, MS in Commerce, and Master’s in Management Studies. In recent years, as management has grown into a highly developed specialization of its own, the Master’s in Management has come into its own as a new path for business students. Intrigued with the Management degree path? Find the best of the best Management programs in the United States on our Top 50 Best Value Master’s in Management Programs ranking. The traditional MBA – whether it’s accelerated, online, executive, or any of the newer iterations of the degree – is well-trod and straightforward. It’s a degree that puts a premium on authority and maturity, usually requiring at least 3-4 years of work experience to even apply in the first place. For that reason, most MBA students are non-traditional college aged, often in their 30s, and are expected to have a business bachelor’s degree. But we all know job experience can be a challenge for new graduates. One of the purposes of the Master’s in Management is to provide younger students who do not have extensive work experience, or working adults who have a bachelor’s degree in something other than business, to earn a management-focused graduate credential. They usually do not require work experience, and often students start an MIM straight out of their undergraduate program. The traditional MBA is highly technical, with very deep courses in mathematics, statistics, economics, and finance, along with specialization courses that allow students to earn a concentration in areas like health care management or accounting. The idea is to prepare the graduate intensively for every aspect of being a business executive, either over a traditional 2-year master’s or an accelerated 1-year program. The MSM, on the other hand, is strictly management-focused, usually foregoing the demanding math and statistics courses that managers may not necessarily need. A Master’s in Management curriculum is oriented toward management theory and practice, with specializations for particular industries; while it may touch on areas like finance and economics, students are steeped in human behavior, motivation, and organization, areas particular to managing employees. Programs are generally only a year or 18 months. There may be some concern among students as to whether the Master’s in Management is a marketable as the traditional MBA; it is a younger degree, and not as widespread in the US. However, a job market in need of qualified, well-prepared managers has embraced the MIM in recent years. Now, MIM graduates may not expect the same pay rate as MBAs, but that goes back to the job experience issue. MBA students had to have job experience to even enter the program, while many Master’s of Management students did not have that experience; they still enter the workforce with less seniority, but with the advantage of official credentials.